If any roaches or pantry pests' (flour beetles... grain weevils etc.) are missed with conventional insecticides... this product will prevent survivors from reproducing. One small device will treat up to 75 square feet. Used in homes... kitchens schools. Sold in 16oz, & Box (10x1oz) sizes. Would you like to see the Gentrol MSDS sheet? 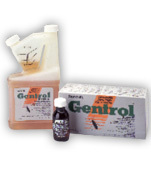 How about the Gentrol IGR Label?